Maps are not infrequently used not to document the world as it is at the time the map is created but as propaganda tools—to show how the world should be, according to the map’s creator. 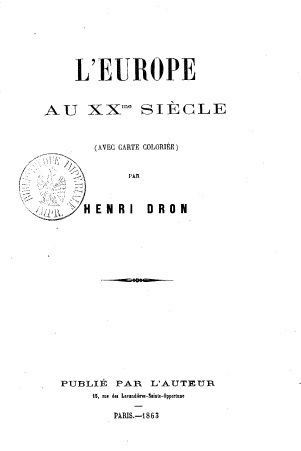 A case in point is the utopian “map of twentieth-century Europe imagined in 1863” from Frenchman Henri Dron’s L’Europe au XXe siècle, published in Paris in 1863. According to the French website Agoravox, the map was rejected by the French censorship office twice, although it does not specify why. 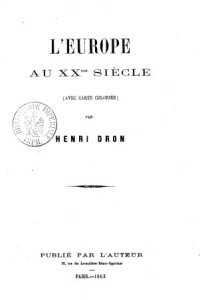 In his booklet, Dron predicted that Europe in the twentieth century would be divided into ten great empires: Spain, Italy, France, Germany, Britain, Greece, Poland, Scandinavia, Russia, and Circassia. According to Frank Jacobs of bigthink.com, “Dron showed himself to be an amateur rather than a connaisseur of geopolitics, by committing the original sin of futurology: assuming that the future will be more sensible, less chaotic than the present”. 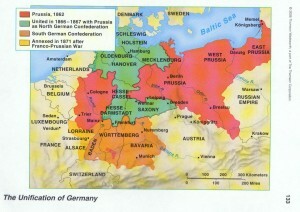 In certain respects, some of Dron’s predictions were on the right track: for example, he imagined that “the tangle of greater, smaller, older, newly formed and still forming European states of his day” would coalesce into bigger states—a tendency that underlies the unification of Germany and the formation of the Kingdom of Italy in the mid-nineteenth century, as well as the later establishment of the supra-national European Union. Yet, the closer one scrutinizes Dron’s map, the more idealistic and the more disconnected from reality it appears to be. The ten empires are all of approximately the same size, with their borders smoother than the actual borders were in his day, or have been ever since, and their capitals are conveniently somewhere near the middle of their territories. Similarly, Vienna, which is located more or less in the geographical center of Europe and right on the border between the Dron’s imagined German and Greek empires, was designated by the French author as the “capital of Europe”. Lisbon, included by Dron in “Spain”, lays claim to the status of the “capital of the world”, perhaps as a nod to the far-flung Portuguese colonial possessions. What exactly that status would entail remains unclear, however. As well as being utopian, this map is also quite anachronistic, in many respects corresponding more closely to the geopolitical divisions of earlier times, which would probably have appeared just as odd to Dron’s contemporaries as they do to us today. 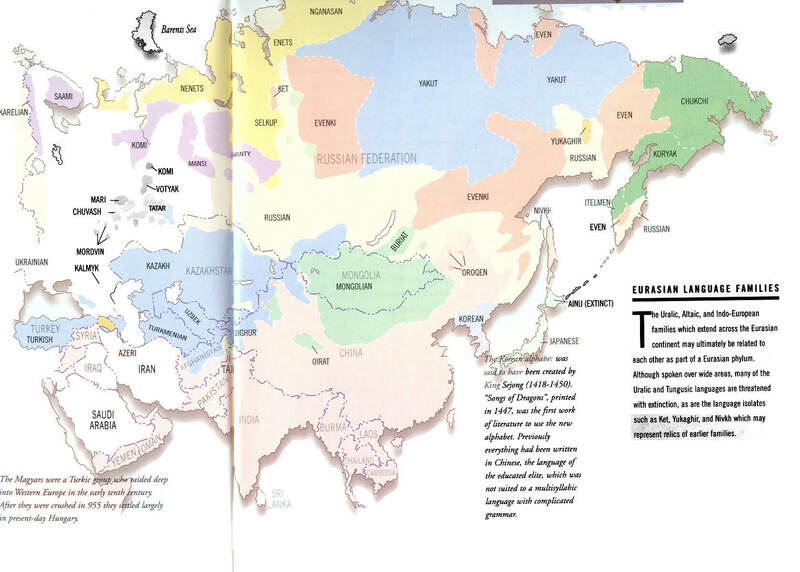 Yet, the map in its entirety does not go back to one particular time, as the author seemingly picks different historical periods for different parts of the continent to suit his overall scheme. But in my opinion, an even bigger sin than assuming the future to be less chaotic than the present is assuming it to be static. None of the geopolitical upheavals that would happen in the twentieth century—territorial changes, emergence and dissolution of states, ethnic cleansing, and so on—were reflected in Dron’s vision, which appears to apply to the whole century. Still, some of Dron’s geopolitical predictions are more bizarre than others. Consider, for example, Iceland, which according to Dron is included in the British Empire, reorienting it towards the North Atlantic. Historically, Iceland has been part of the Scandinavian world—ever since its discovery by Gardar Svavarsson and subsequent settlement by the Vikings. Geopolitically, Iceland was part of the Kalmar Union, alongside Denmark, Norway, Sweden, and a large portion of Finland. 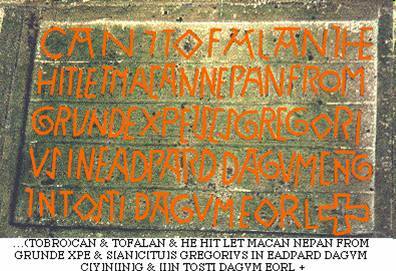 The language of the present-day Icelanders is a descendant of Old Norse, which influenced the languages of the British Isles but did not replace the earlier Celtic and Germanic tongues. However, although Dron could not know this, recent genetic studies have revealed a connection between Iceland and the British Isles, as many of the Icelanders’ maternal lineages trace back to Ireland. Ethno-linguistic considerations are also ignored in the placing of Finland—a Finno-Ugric-speaking country—in Scandinavian Union, which apart from inclusion Iceland appears to be an anachronistic reference to the Kalmar Union, which existed from 1397 to 1523. As pointed out by Jacobs, both Denmark and Finland are depicted as larger than they were in 1863 or than they are today. Denmark in Dron’s map still included its southern territories that were lost in the Second Schleswig War of 1864, and Finland, at that time still a Russian grand-duchy, encompassed the Kola Peninsula and all of Karelia up to the White Sea. The depiction of Russia on Dron’s map appears to be intellectual revenge for the military defeat of France by the Russians in 1813. 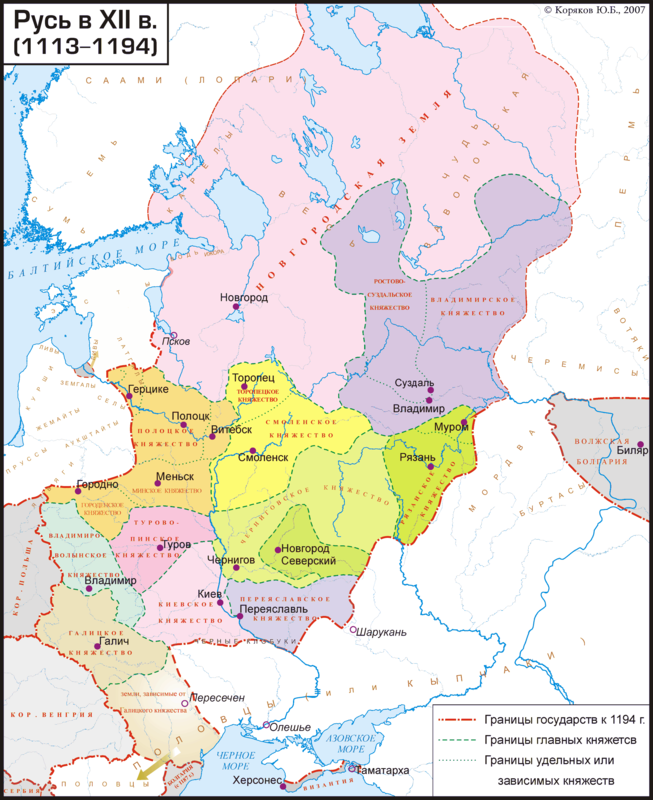 Russia is shown to be much smaller than it was at the time or ever since: some of its northern territories are included in Scandinavian Union, its western areas (today, mostly parts of Lithuania, Belarus, and Ukraine) are joined with Poland, the vast portions of its southern region are encompassed by Circassia, and its eastern border is drawn at the Urals. This depiction of Russia is quite anachronistic for 1863, as it corresponds most closely—though not precisely—to the extent of Russia in the 13th century. 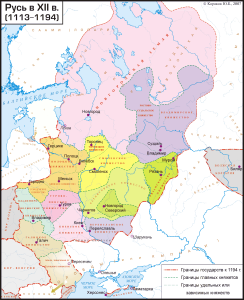 The choice of Novgorod as Russia’s capital also strikes one as seriously out-of-date: Novgorod was a key link between Russia and the Hanseatic League and a major cultural center in the 11th-15th centuries, but it relative importance declined in the 15th century as that of Moscow grew. In 1863, Novgorod was a small provincial city, a status that it retains to this day. 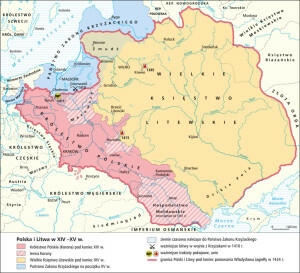 Although Dron’s imagined Russian state does include most of the Baltic countries—Estonia, Latvia, and a portion of Lithuania—a considerable chunk of what was then the Russian Empire—has been given to Poland, which emerges as a major European empire, also quite anachronistically, as its extent from the Baltic to the Black Sea is reminiscent of the Polish-Lithuanian Union in the 1400s. 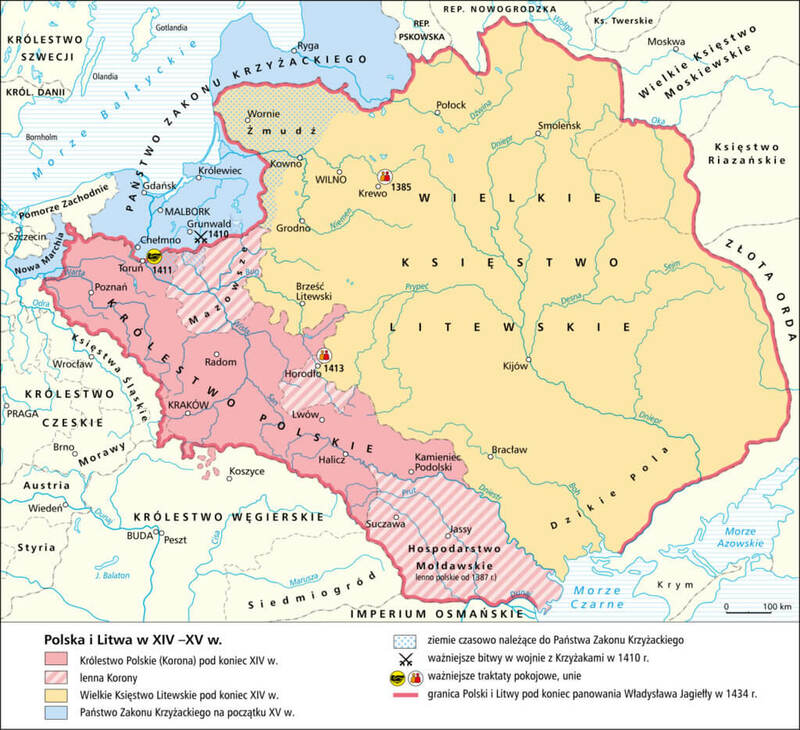 This vision of a greater Poland is particularly peculiar for 1863, when Poland had virtually disappeared from the European map after the three consecutive partitions in 1772, 1793, and 1795 divided and re-divided its territory between the Prussians, Russians, and Austrians. The capital of this newly enlarged Poland is left unspecified though judging by its location due east of Dresden it would not be Warsaw. Wroclaw, Krakow, and Lublin seem to be among the possibilities of what the French futurist had in mind, but it is hard to tell more precisely from his rather crude map. It is also possible that he would prefer to construct the Polish capital from scratch in order to locate it in the geographical center of the country. Similarly, the capital of Circassia—a state that constitutes “doubtlessly Dron’s greatest leap of the imagination”, as Jacobs puts it—is also left unspecified, and its location indicates one of European Russia’s southern cities or a city to be constructed expressly for that purpose. 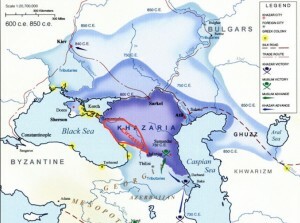 The emergence of such a large Circassian state would certainly make many of today’s Circassian activists jump with joy, but would anger not only the Russians but also other groups indigenous to the North Caucasus, such as the Chechens, the Ingush, the Ossetians, and the many ethno-linguistic groups from Dagestan, whose geopolitical aspirations—particularly, the establishment of the Caucasian Emirate—would be frustrated under Dron’s scheme. From the point of view of 1863, such an extensive Circassia seems nothing but bizarre, as the century-old conflict between the Russian Empire and the Circassians was reaching its apogee at that time. In the year following the publication of Dron’s map, the Circassians would be defeated, decimated, and sent into diaspora. Did a Circassian victory still seem possible to Dron, or was he, as Jacobs says, “moved to territorial generosity as only compassion for the victims of a distant defeat can engender”? We cannot tell. 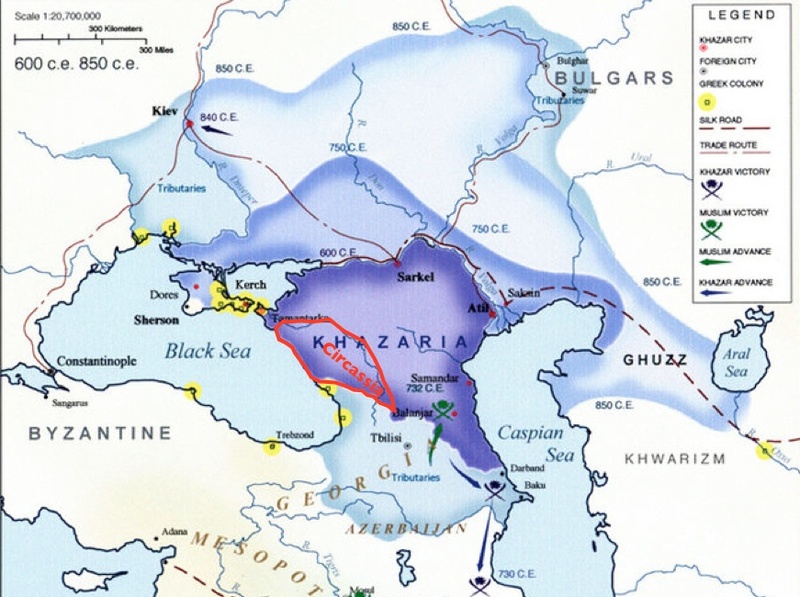 It is also possible that this vision of greater Circassia is another example of Dron’s anachronistic approach to geopolitics, reflecting the “golden age” of Khazar Empire circa 850 CE. At any rate, the newly formed Circassian state in Dron’s vision of geopolitics was perhaps meant to stop any further invasions from Asia, something that had long been a major worry for the inhabitants of Western Europe. Although in the 1860s the Ottoman Empire was trying to strengthen its fartherest outposts through the resettlment of exiled Circassians, Dron assumed that it would soon disappear from the map, or at least diminish significantly. The vacuum created by the Ottoman withdrawal would be filled by the emerging Greek state, which the Frenchman imagined to extend up the Balkan Peninsula all the way to the gates of Vienna. To the likely chagrin of the South Slavs, the capital of this newly enlarged Hellenic state was located in Belgrade. The Austro-Hungarian Empire vanished from Dron’s map, its territory divided between the Greek Empire, Poland, and Germany. The latter, which in 1863 was beginning to take shape as a unified nation under the auspices of the Kingdom of Prussia, would retain not only much of Austria, but also all of Bohemia and the western part of present-day Poland, then Prussian territory. 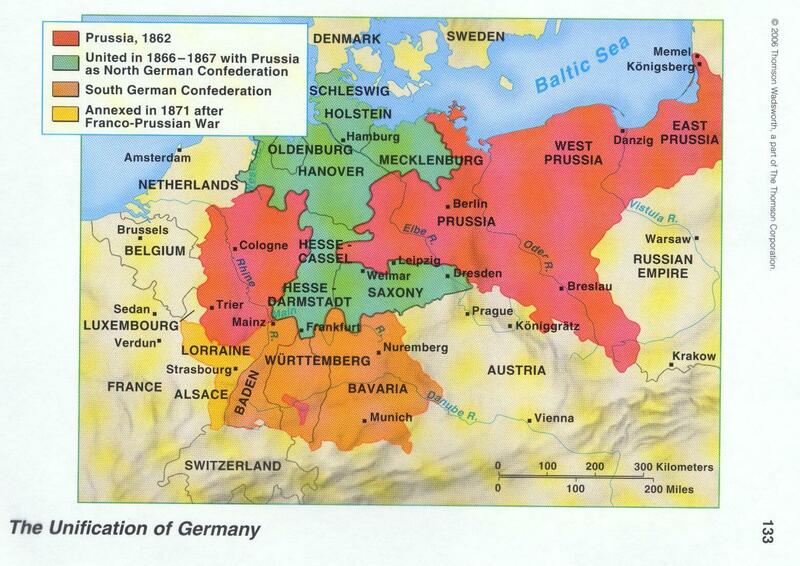 Yet, significant portions of Prussia were given by Dron to Poland. More generally, it appears that Dron intended to weaken both Germany and the Russian Empire—France’s main geopolitical rivals in Europe in the nineteenth century—by giving some of the territories they owned at the time to Poland. Dron’s choice of Dresden, today only the 11th largest city in Germany, as the German capital may seem rather odd to us today, but it made sense within Dron’s view of Europe: geographically, its location was central within the territory that he allocated to the country, and historically, it has long been the capital and royal residence of the Electors and Kings of Saxony. From 1806, Dresden was the capital of the Kingdom of Saxony, which would become a part of the German Empire eight years after Dron drew his map. During the Napoleonic Wars, the French emperor made it a base of operations, winning the famous Battle of Dresden on August 27, 1813. Dresden was a center of the German Revolutions in 1848 and suffered significant damages in the May Uprising, and in the second half of the 19th century it began to emerge as a major center of Germany’s economy. As both Belgium and Switzerland, as well as the smaller feudal remnants such as Luxembourg, Lichtenstein, Monaco, and Andorra, have been obliterated from Dron’s map, the territory of France on this map is somewhat larger than it was back in 1863 or is today. 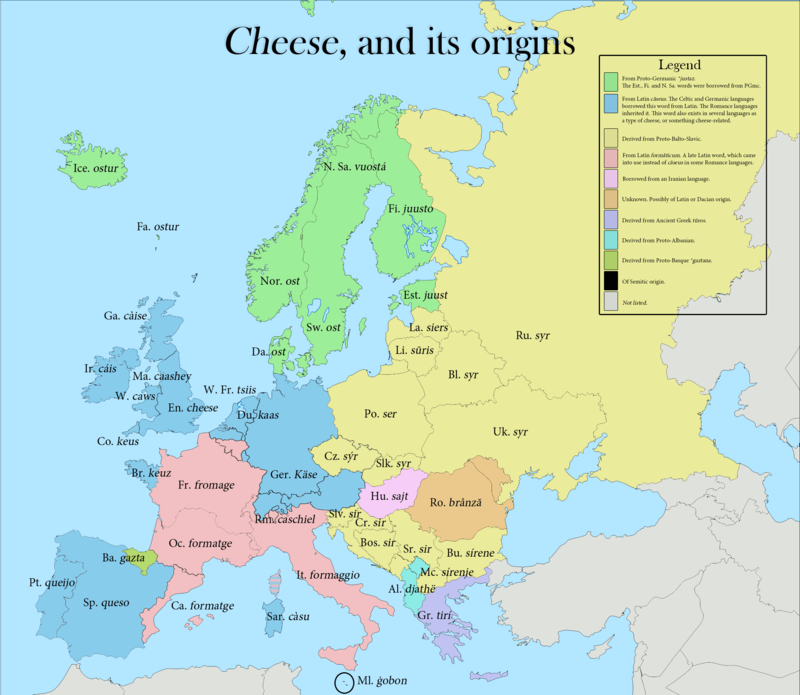 Unlike the cases of Scandinavia, the Balkans, and Circassia, it appears that ethno-linguistic considerations plays a role here, as the French territory on Dron’s map included the French- (or Walloon-) speaking areas of Belgium and Switzerland. 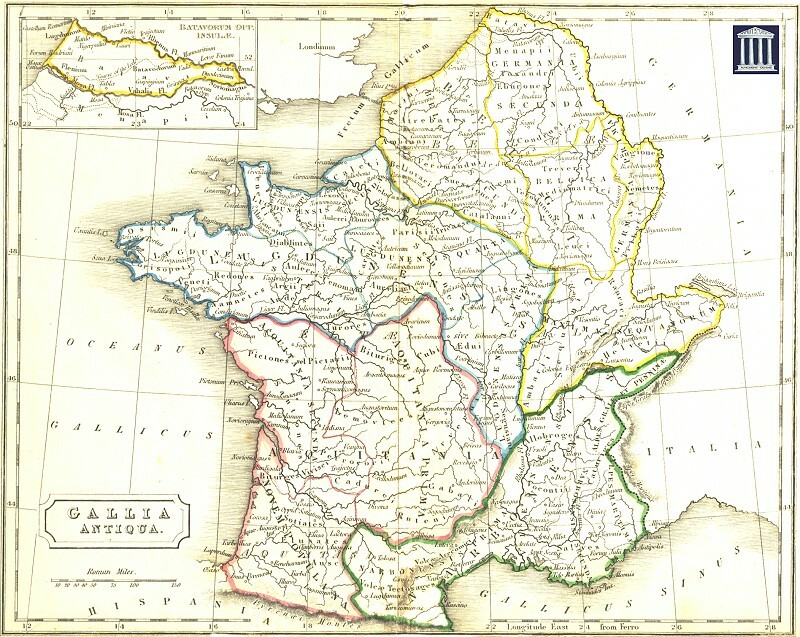 However, some non-French-speaking areas are included in this French empire as well, particularly Luxembourg and parts of Germany and the Netherlands. Thus, Dron’s own homeland seems to be viewed anachronistically as encompassing the territory of ancient Gaul, as described by Julius Caesar. Also anachronistic is Dron’s view of the Iberian Peninsula, as he imagined Portugal and Spain reunited to form an all-Iberian empire, even though in 1863 Portugal was independent. Dron’s map brings us back to the period between 1580 and 1640 when a personal union of the Spanish and Portuguese crowns ensued after the Portuguese dynastic crisis left the Avis dynasty without an heir. Curiously, Toledo rather than Madrid was chosen by Dron to be the capital of the Iberian Empire. This is another anachronistic feature of the proposal, as it reverts to the period before 1561, when the Spanish royal court moved from Toledo to El Escorial complex in Madrid. Last but not least, Dron forecasted that Italy would be unified, which was not a hard prediction to make in 1863, as the Kingdom of Italy had already been proclaimed on March 17, 1861. Two important regions—the Veneto and the Papal States—were to be added in 1866 and 1870, respectively. Dron also correctly predicted that Rome would become the capital of unified Italy: although Florence would first play that role for a brief period between 1865 and 1870, Rome became the capital of Italy in 1871. Like other states in Dron’s vision, Italy would gain additional territories including a bit more of the Riviera, the Savoy, and the Adriatic than it has at present.